Over a week ago while I was at NE-NC GSA in Pittsburgh, several tweets resulted in me promising blog posts. 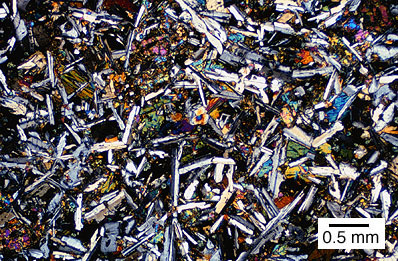 Today’s sequence of posts is a result of Dana Hunter’s request to understand better how garnet schists form. I was originally going to do this in one post, but its too ridiculously long. 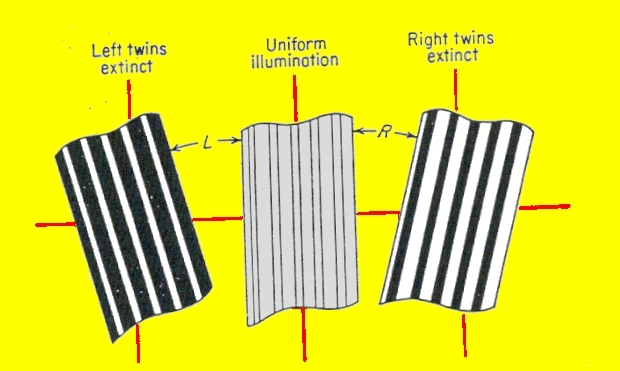 Instead we’ll have this post on the theory behind metamorphic reactions. 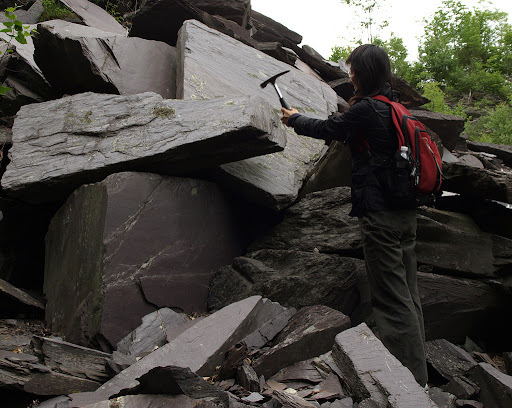 A second on contact metamorphism of a shale. 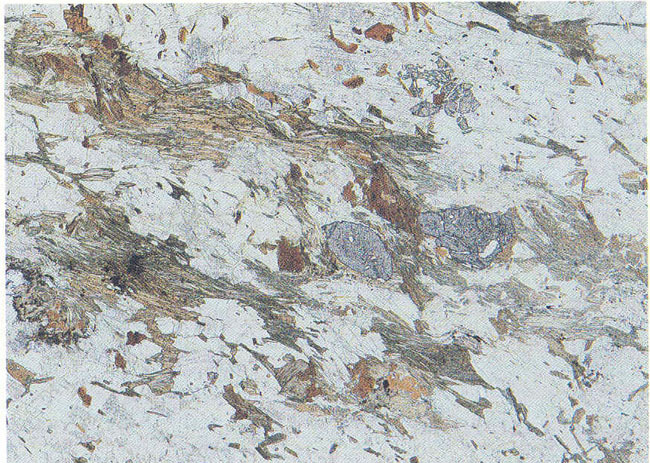 And our final one on the formation of a garnet schist from a shale. 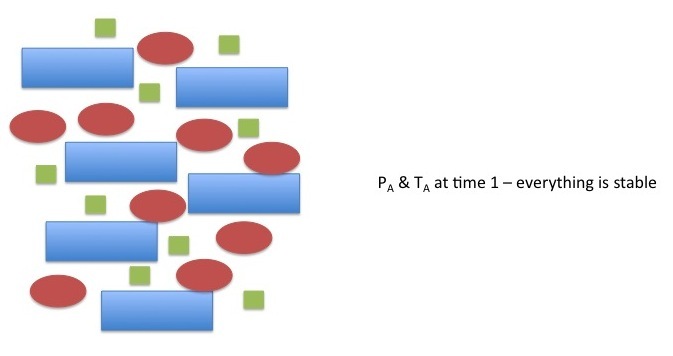 The base concept for metamorphic petrology is that thermodynamics tell us what should be present at any given pressure (P), temperature (T), water conditions, etc. (the item with the lowest energy = most stable), but kinematics gives us an idea how quickly a reaction will take place & whether or not the predicted phases will be present. 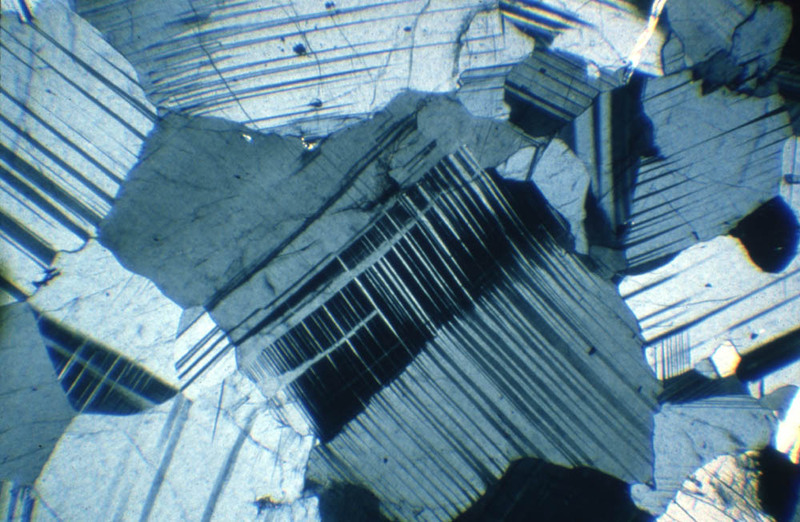 However, one of the most important thing to understand about metamorphism is that you have deal with the hand your dealt–the chemical components (Si, Fe, H2O, etc.) 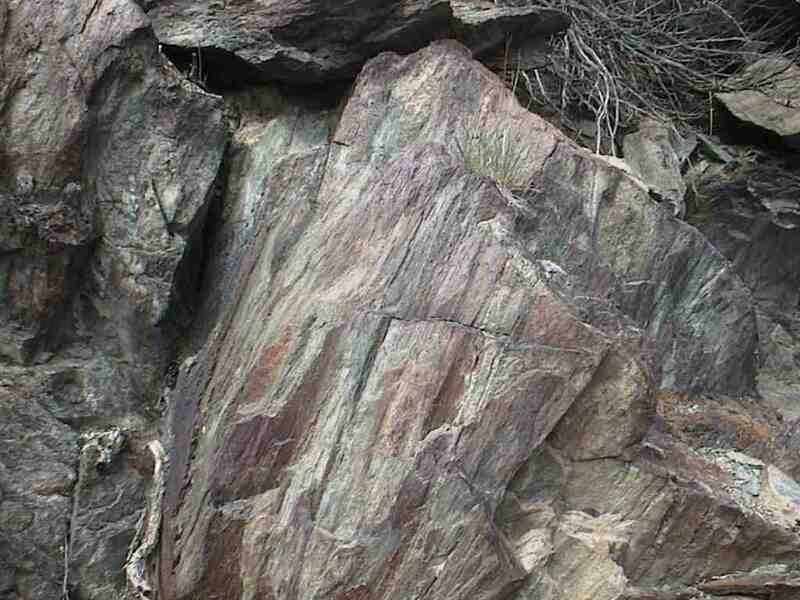 that are in protolith (original, unmetamorphosed rock) will either have to be in your subsequent metamorphic rock or leave the system in a believable fashion. This is one of the reasons why memorizing the chemical formula of the common rock-forming minerals is actually useful–it gives you an idea about what could have been & what may have occurred to produce the rock now in your hand. Before I move on to how the reactions work, let’s take a second and talk about “leave the system in a believable fashion.” Some elements and compounds on our planet are very mobile and can move in & out of a system (a user-specificied volume that’s being studied). 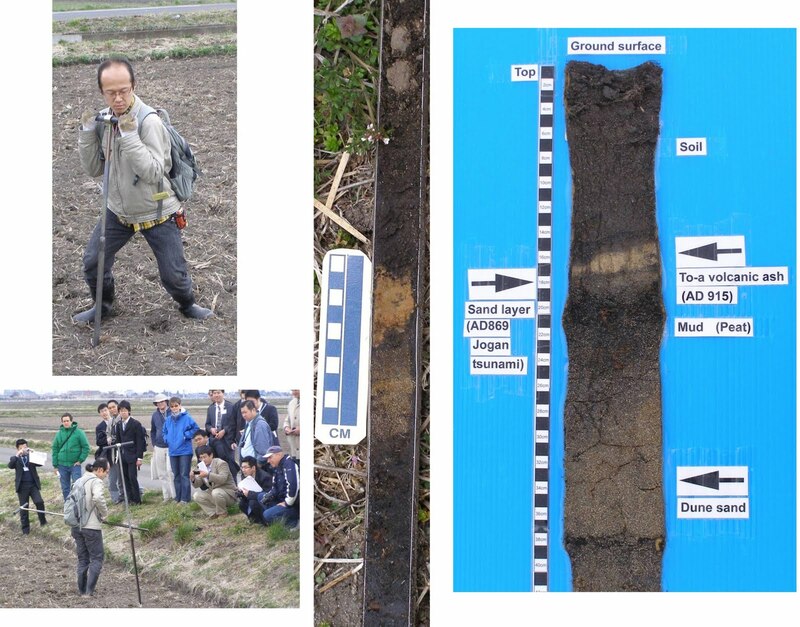 When we metamorphose a rock, its easy to believe that these mobile components can drift in or out depending on the P & T conditions. Other elements are relatively immobile and rarely travel any great distance. 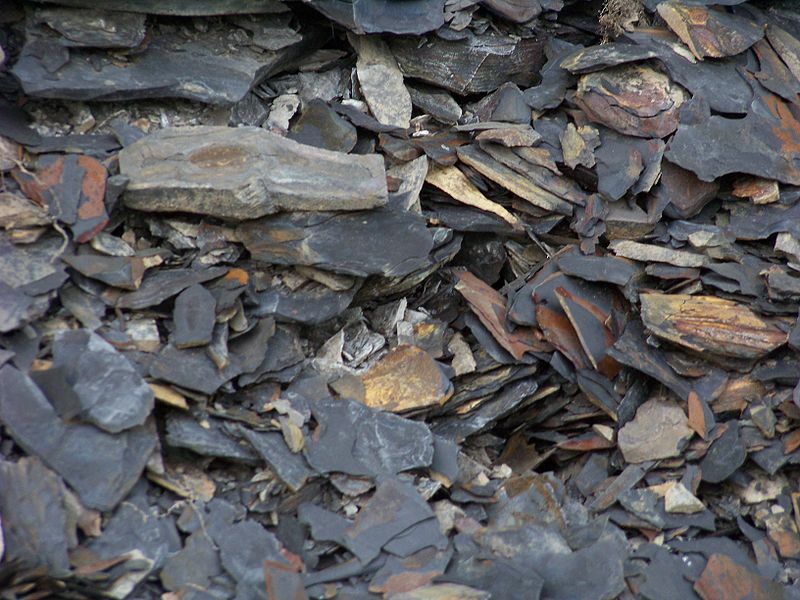 In metamorphic systems, these are the elements we simply have to incorporate both in the original minerals & any subsequent minerals that form. P&T will control how mobile an element is (hotter = more movement possible), but also the presence of fluid can make elements more mobile. For instance, uranium is fairly mobile in the presence of a fluid phase — but there’s usually not much uranium in a rock to start with (usually in the parts per million (ppm) or parts per billion (ppb) range), so its not a huge concern when we try to balance a system. As P&T changes along a prograde path, our rock looses water and/or carbon dioxide and some of the components begin to be less stable than a new group of minerals. 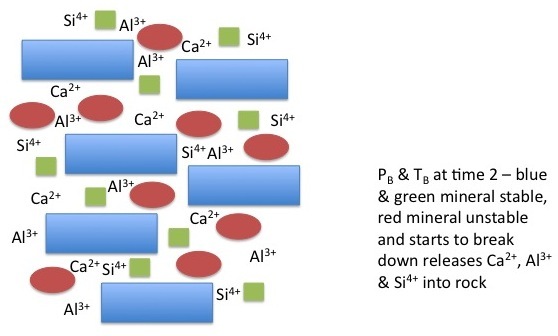 Though occasionally one mineral will simply switch to being a new mineral that is more stable, usually that instant switch is restricted to polymorphs (two different minerals with the same composition) that only need to change minor things in the structure (e.g. 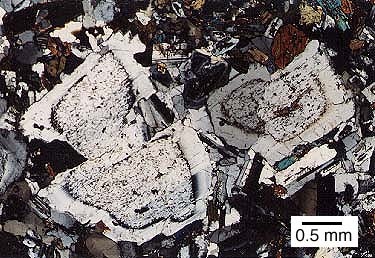 alpha-quartz to beta-quartz). 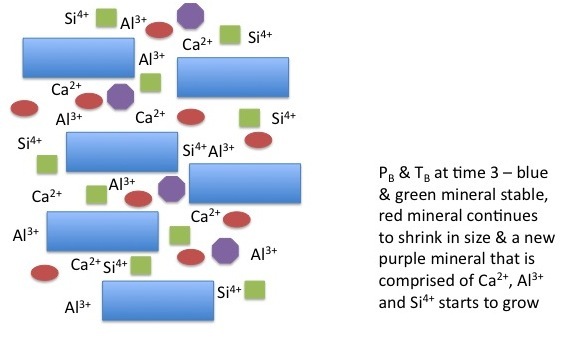 Most of the time, one (or more) mineral(s) will slowly lose an ion here and an ion there and a then new mineral(s) will use the released ions to grow. 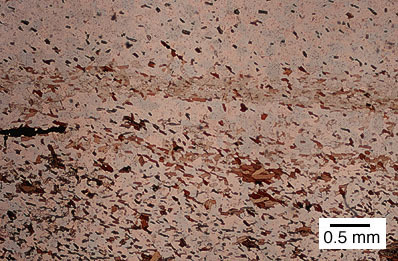 These ions can either move around the outside of grains either with or without a fluid phase present or through a mineral–the latter is much slower, even though it might be a more direct path. 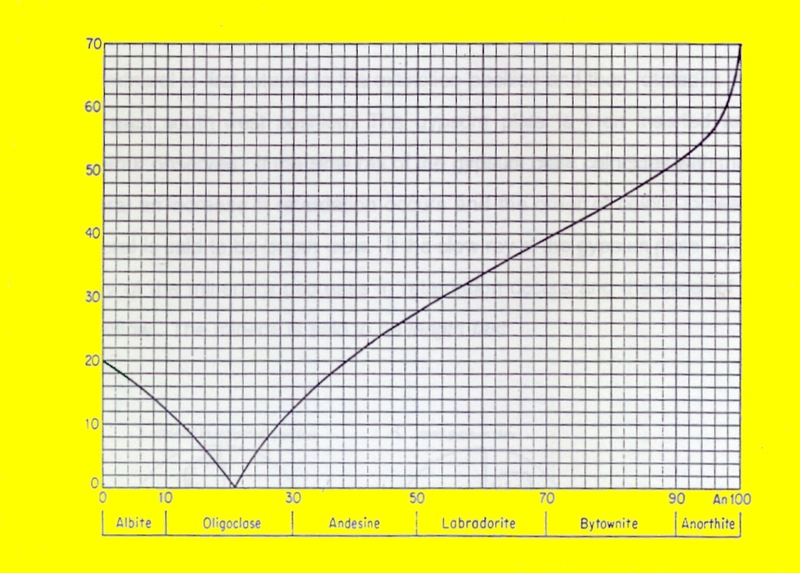 If we had suddenly taken the rock after step 2 or 3 back up to the surface of the Earth, instead of preserving an equilibrium assemblage where all of the minerals are stable, we would have captured a moment of disequilbrium and a reaction frozen in its progress. For most metamorphic analyses, equilibrium is what we are trying to find because we can calculate via thermodynamics what it should be. However, in my mind, its the disequilibrium of frozen reactions that are more fascinating. I think that’s enough theory for now. Let’s start dealing with a real rock. I was sitting in a paleomagnetism talk at NE-NC GSA in Pittsburgh Sunday when the speaker put up a picture of several unidentified ore minerals & pyrite. 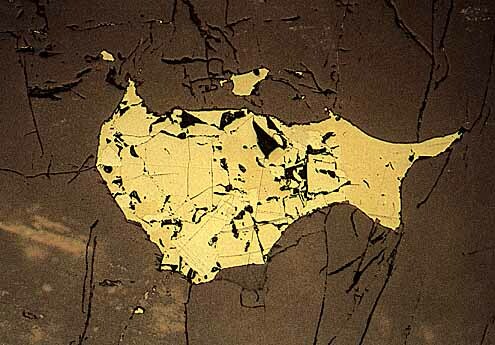 1) I had never seen a reflected light photomicrograph in a conference talk before [I don’t normally sit in paleomag sessions…] and 2) pyrite is this week’s choice! 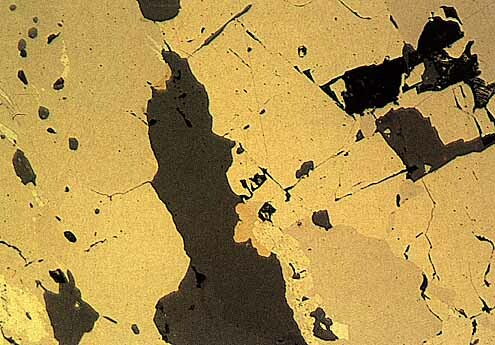 So, what does pyrite look like? In transmitted light, pyrite will be another one of the opaques (black both in PPL & XPL). I think the take-home message here may simply be: either get very good at distinguishing small changes in color & how reflective a surface is OR hope that your department has an SEM down the hall. At Gustavus, we’re dealing with the former right now. Part of me is just surprised its already Wednesday. I’m leaving Friday afternoon for Pittsburgh, so my plane trip is closing in fast. Links for Friday, Saturday, Monday and Tuesday. 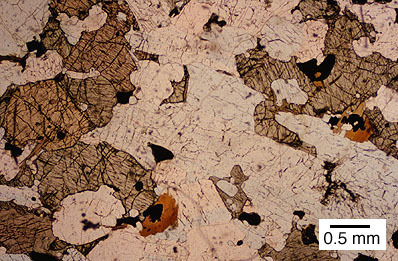 Today’s mineral is a common sight to igneous and metamorphic petrologists, though how we ID plagioclase (or plag for short) in a gabbro vs. a garnet schist will vary quite a bit. 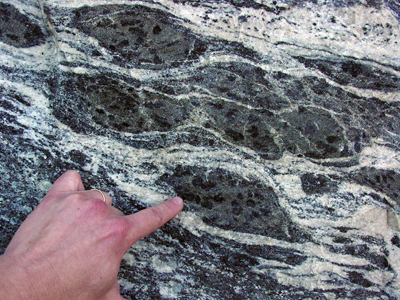 Plag varies from Na-rich (albite or Ab-rich) to Ca-rich (anorthite or An-rich) with complete solid solution between the two end-members. 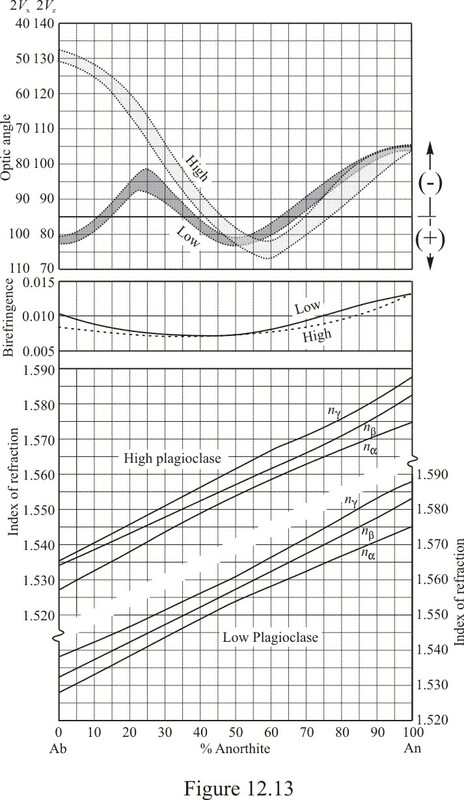 The difference in composition is reflected in a variation between low refractive indices (Ab-rich) and “higher” refractive indices (An-rich). 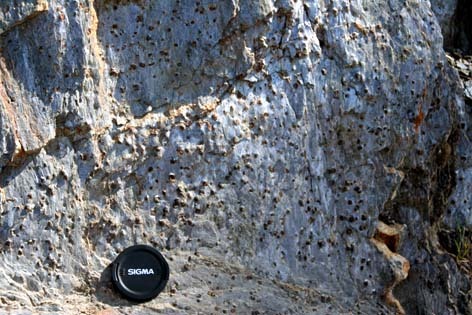 In PPL, plag is almost a dead-ringer property-wise for the K-feldspars, quartz & cordierite. 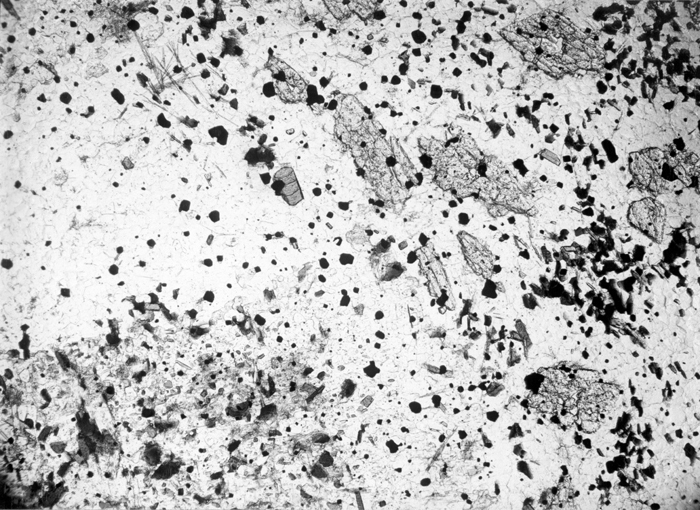 Plag is usually clear with low positive relief, though Ab-rich plag will have a low negative relief (see figure above). 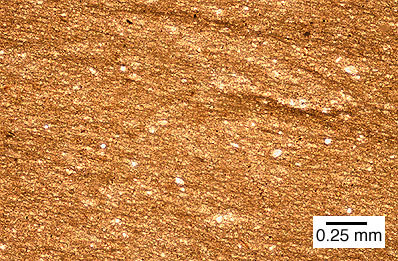 Similar to the K-feldspars, plagioclase is more likely to alter to a clay (in this case a white mica called sericite), which you may be able to see in plain light as little dots or imperfections. 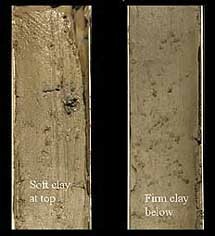 Though plag also has two good directions of cleavage like K-feldspar, because of the low relief we rarely (if ever) can distinguish the 90 degree planes. 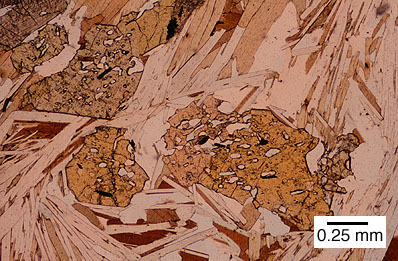 In mafic igneous rocks, plagioclase is more likely to be lath-like than the other other clear, low-relief minerals, but tends towards more equant grains in felsic igneous & metamorphic rocks. 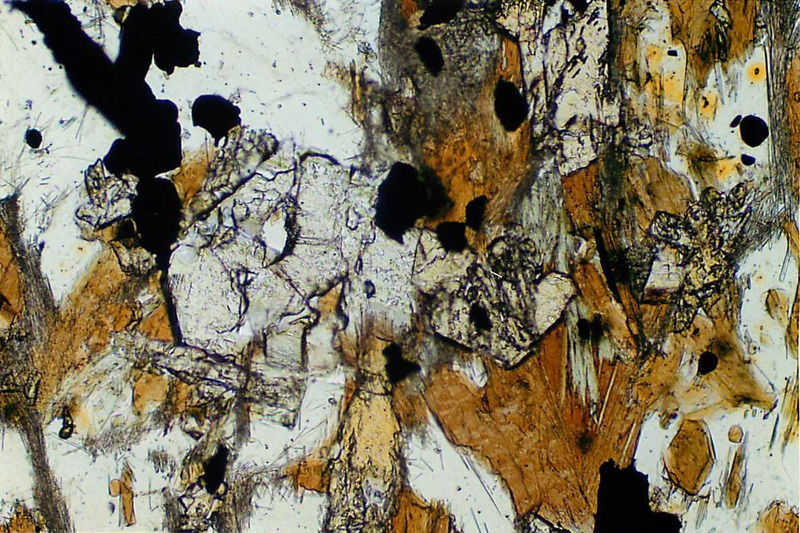 In XPL, we can have more hope of distinguishing between plag and the other minerals–at least in igneous rocks. 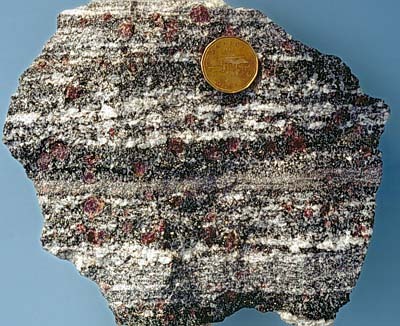 Just like twinning is commonly found in igneous K-feldspars, plag also frequently is forms twins during growth from a magma. In plag’s case, the twins are called “polysynthetic” and kind of look like jail bars. Plag can also have simple twins (usually in very An-rich grains), but the polysynthetic ones are more common. 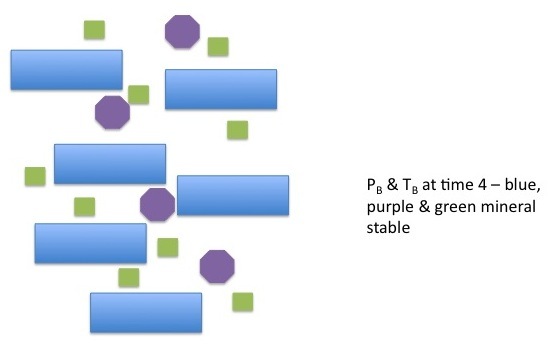 Plag has complete solid solution between the An & Ab end-members, but the diffusion between Na1+ & Ca2+ is fairly slow within a single crystal because the charge imbalance requires coupled substitution. 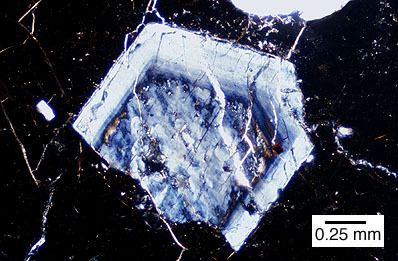 As plagioclase grows out a melt, the melt’s composition will change and become more enriched in whatever ISN’T being used by the plag (and anything else that is growing). An crystallizes at higher temps, so the melt will be first depleted in Ca. The next plag that grows won’t have the same ratio of Ca/Na to incorporate, so the next layer that grows will be more of a Ca-Na plag. 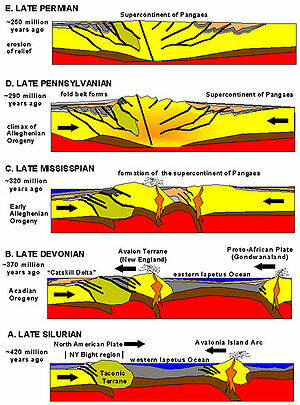 As this continues, each additional layer will be more & more Na-rich assuming that no Ca is magically injected back into the magma chamber. 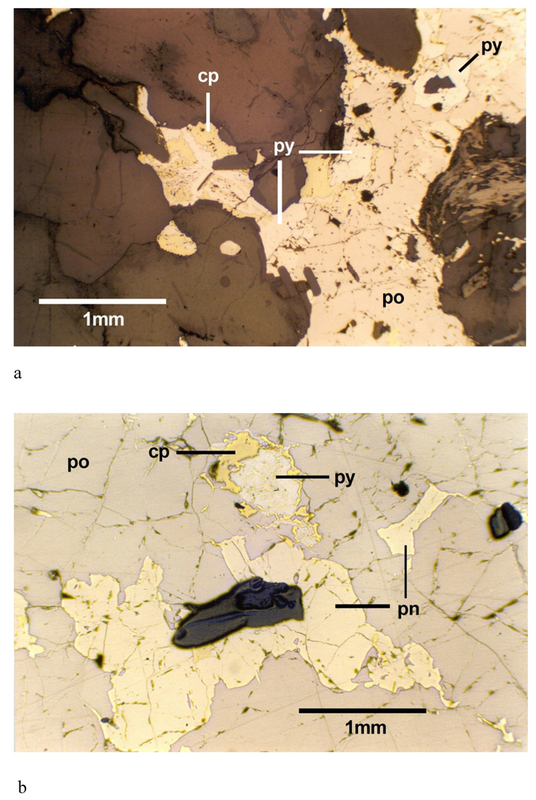 We can actually see this in thin section, since each type of composition of plagioclase has a slightly different set of crystallographic axes (= varying refractive indices). 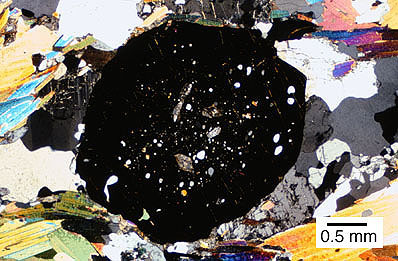 Each orientation of the specific plag compositions will have a slightly different extinction angle (almost all of which are non-parallel)–we look for the maximum EA possible in the thin section. On the practical side, this means if the plag is zoned, we’ll be able to see the variation from core to rim. We can also estimate what the composition of the plag is without trying to find an optic axis figure (which would also work if we note the change in 2V on the first figure way up at the top of this post), so that usually saves us some time. 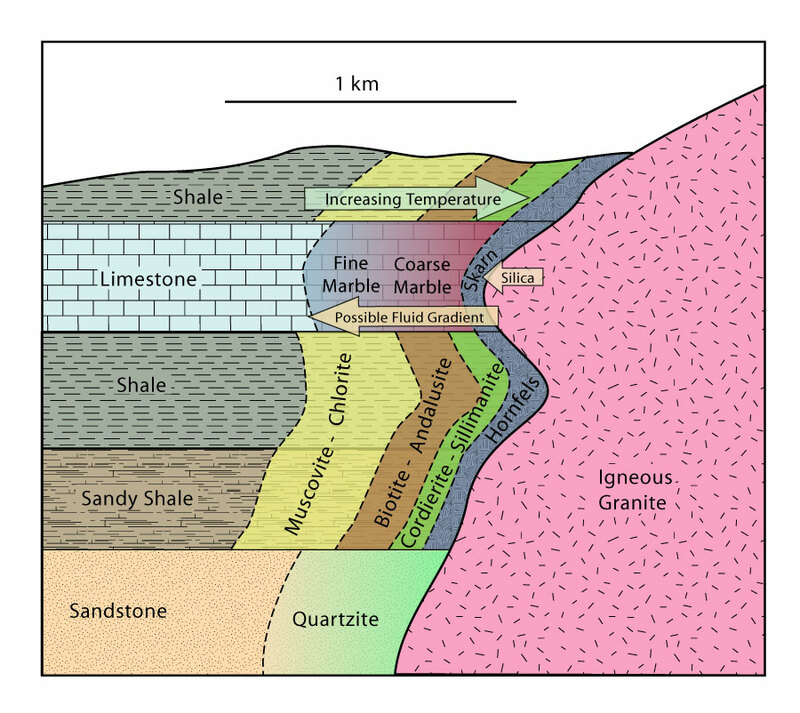 Ok, this works well for igneous plag, but there are some issues when we move over into metamorphic rocks. 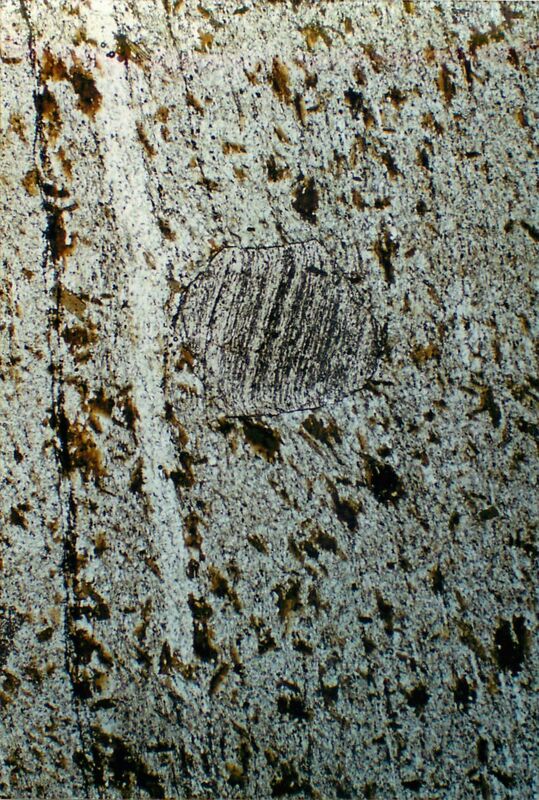 The process of metamorphism usually either erases what zoning or twinning was present & plag that grows due to solid-state reactions doesn’t form twins, so plagioclase most common looks just like quartz, K-feldspar, or cordierite. 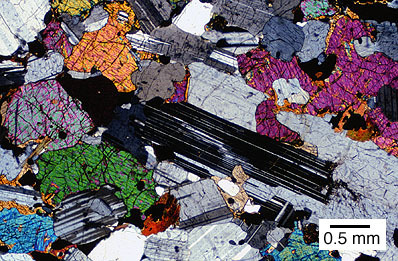 Luckily, cordierite is only present in low-pressure, high-temperature rocks & forms pleochroic haloes around U/Th bearing minerals, so we can rule that out quickly. 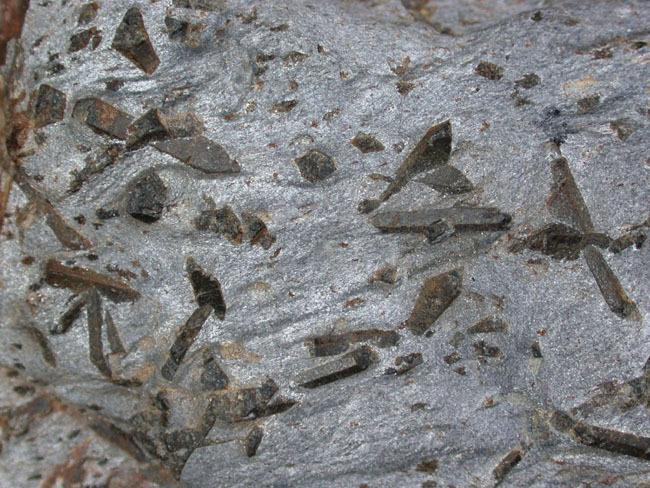 K-feldspar may occur in metamorphosed felsic igneous rocks, but is rare in metasedimentary rocks until high temperatures, so usually we don’t have to worry about it either. However, quartz is almost everywhere. 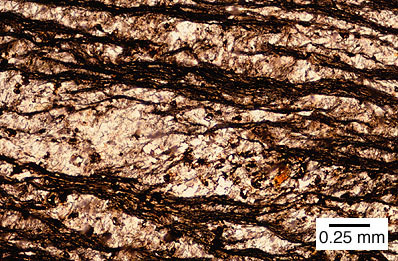 And differentiating between quartz & plag in metamorphic rocks is probably one of the most annoying things to do with a PLM. 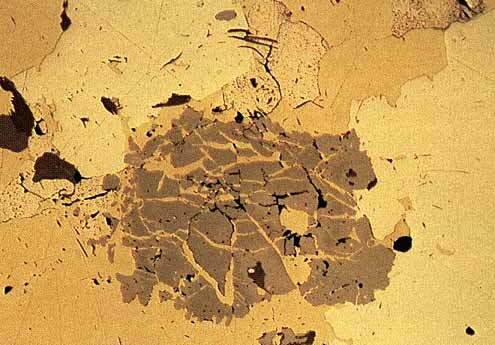 Next week, we’re returning to a mineral that most of you won’t recognize in thin section (which probably means Chris Rowan will be happy! ): pyrite.